“The final day of rehearsal in the practice ballroom before moving onto the stage tomorrow — ahhh!” I woke up feeling completely rejuvenated, possessing a newfound sense of excitement. Perhaps that was a result of the spa night or maybe a good night’s rest. Nonetheless, I kept trying to tell myself that this is a marathon, not a sprint. After all, nearly two weeks spent in Atlantic City, exuding utmost energy and a connective mindset can be draining. We spent the morning refining walking patterns and ensuring everyone was ready to take to the stage the following day. 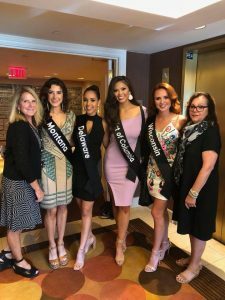 We went to the Golden Nugget Hotel for dinner and were told we would get to briefly hear from the judges, which needless to say was super exciting. What we were not told was that two forever Miss Americas would be joining us for dinner. Upon arriving, we discovered Heather French Henry, Miss America 2000 (pictured on the far left below) greeting us with a big smile as we walked in. 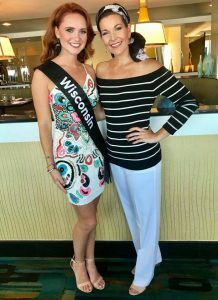 Before going up to get food, I chatted with Heather and was absolutely floored to find out she remembered me running out to greet her along the boardwalk two years ago when I was in Atlantic City with my mom, attending Miss America to support our Miss Wisconsin 2016, Courtney Pelot. A little while later, Katie Stam Irk, Miss America 2009 showed up and was a joy to talk with! If you ever get a chance to meet her, you’ll know just what I’m talking about! One of our awesome security guards, Kevin accidentally knocked my crown box out of my hands on Thursday morning as we were exiting the jitney at boardwalk hall. The box went flying, opening up mid-air as my crown and the wooden box hit the ground. My initial reaction was to laugh because let’s face it, what was there I could’ve done in the moment? Kevin was sweet enough to take my box and replace the hinges. I reassured him that it was okay and that accidents happen. Truth be told, it added some character to my trusty box and made for a good story! Boardwalk Hall is cold, I mean freezing! Sweatshirts and cute sweaters were life savors; in addition to the ‘Miss America 2.0’ fleece blanket gifted to us from 4imprint. “My alarm went off at 6 AM and I naturally hit snooze a couple of times before jumping up to shower and get ready. I FaceTimed my Harbor Cities Director, Abbey at 6:30 (5:30 AM Wisconsin time, bless her heart). I put my headphones in, wet hair and robe (aloe green tea under eye strips and all) sitting in the bathroom with the door closed to minimize the sound since my roommate was still sleeping. We talked about what John McCain’s legacy will be, how I would move the Miss America rebrand forward, more about my journey and platform to get warmed up.” I felt nervous, but ready for my most exciting interview to date. I took the Jitney over to Boardwalk Hall like I had the seven days prior, but the energy was extremely different this morning; competition was officially about to begin. Shortly before going up to the holding room for interview my girl, Miss Texas handed me a prayer book of hers, suggesting I read a specific passage. It alluded to courage and perseverance and overall trusting in God’s timing – an oh-so familiar mindset I had learned to embrace (the past few years in particular.) I paced around the holding room, taking a few seconds to look out the window, reflect on my journey and focus on being present in the moment. Before I knew it, it was time for me to enter the interview room. I walked down the hallway, shaking my cold, clammy hands before taking a deep breath and entering into the interview room. After my private interview was complete, I changed and convened with the other groups who were practicing on stage for the first time. We had a little down time between transition and I remember walking out from our dressing room behind stage, riding out the positive high from interview thinking, “I can do this! I could be Miss America!” In that moment, standing on Boardwalk Hall stage, succumb by the historic value and energy of the vast venue I envisioned myself in my turquoise long-sleeve gown being crowned. I felt an overwhelming sense of contentment and excitement knowing it was all in God’s hands and I was ready to put my best self forward in the remaining phases of competition when prelims began the following evening. Want to book Miss Wisconsin for an upcoming event, judging opportunity, school engagement, parade, or corporate function? Head to the Miss Wisconsin Appearances tab on our website and submit a contract request or send an email to booking@misswisconsin.com for more information! We look forward to hearing from you! Miss Wisconsin Scholarship Organization Inc.